I'm not really much of a car collector at all. In fact I think the extent of my diecast collection goes as far as the Johnny Lightning Star Trek ships and Hot Wheels Bat-vehicles. 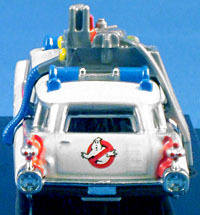 So it was news to me when Mattel announced a Hot Wheels Ecto-1 from Ghostbusters for San Diego Comic Con 2010, especially that it was a re-release of a standard car in their Hot Wheels line that proved to be a quick sell-out everywhere (no kidding... what, Mattel under produce something collector-oriented? No!). I feel I need an Ecto-1 to go with my Movie Masters and Minimates Ghostbuster collections so I bought into this little guy for the steep price of $20. From what I understand, this is a straight repackage of the original Hot Wheels release. It's about the same size and quality as one would expect from Hot Wheels, with the car body being diecast metal and the rest (undercarriage, wheels, GB-bits'o'flair) being plastic. The insides seem surprisingly more detailed than I had anticipated, with all the tech junk in the back. I think I can even make out a proton pack through the back window. What makes this release "special" is the packaging. 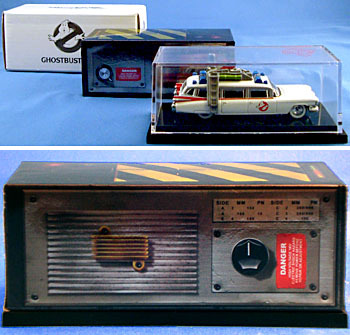 Rather than being packed on a blister card, the car is mounted via two screws to a black base, and is enclosed in a clear plastic box that has both the Hot Wheels logo and "GHOSTBUSTERS ECTO-1" printed on the front top. The plastic case is easy enough to pop off with the proper leverage applied to the clips holding it in place from below (be careful, though: breakage is a distinct possibility). The screws are also, I'm sure, easy to undo in order to remove the car from its base, were you so inclined (let it be known I am not). 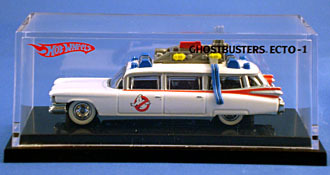 In addition, the car originally comes in a white box, familiar in style to those of us who are Matty Collector abuse victims/junkies, with the Hot Wheels and Ghostbusters logo printed on it. Open that and you'll find the car on base, with the plastic case covered by a slipcase which easily slides over the clear plastic. This is printed on metallic paper and is designed to look like the ghost trap (with a Hot Wheels logo hidden on one side). It's cool, but just another in a long line of Mattel SDCC packages too cool to get rid of but too useless to keep. I suppose it's better than nothing, if they needed a cover for the plastic, but still... I just don't know what to do with it. All in all I'm pretty happy with this gal. I thought I would end up being pissed at the $20 pricetag; after all, normal Hot Wheels cost under $5 and even the licensed Bat-vehicles cost under $10. But the trophy-style display case is pretty cool and helps the car look less "tacked on" in my GB display - it makes it a better collectible.